Chinese sprinter Su Bingtian leveled the Asian record of 9.91 seconds at the 2018 IAAF World Challenge Meeting in Madrid on Friday. Su Bingtian (C) of China competes during the men's 100m match at the IAAF World Challenge Meeting Madrid 2018 in Madrid, Spain, on June 22, 2018. 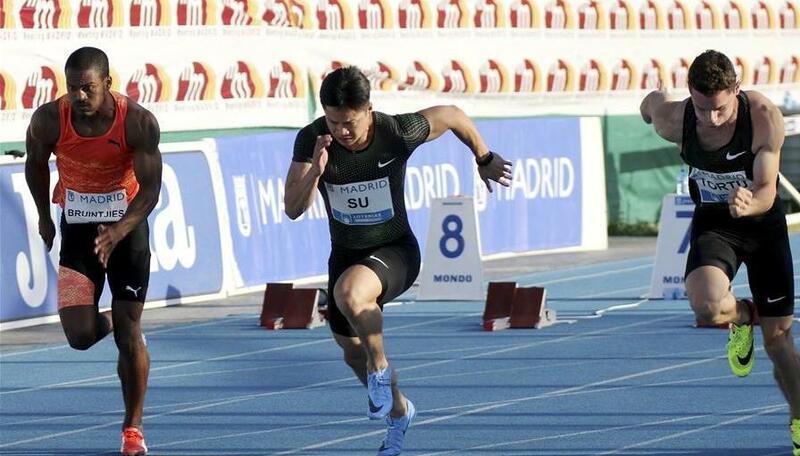 Chinese sprinter Su Bingtian has moved 0.08 seconds closer to the men's 100 meters world record held by Jamaican legend Usain Bolt after he leveled the Asian record of 9.91 seconds at the 2018 IAAF World Challenge Meeting in Madrid on Friday. The 28-year-old won the title with a tail wind of 0.2m/s, also refreshing China's national record set by Xie Zhenye at the Meeting de Montreuil three days ago, by six- hundredths of a second. Su's previous personal best was 9.99 seconds, which he clocked twice at the 2015 IAAF Diamond League Eugene meeting and the World Championships in the same year as the first Asian-born athlete to run under 10 seconds. Su also led China to second place of the men's 4x100m relay at the 2015 Beijing World Championships. Prior to Su's achievement in the Spanish capital, Qatar's Femi Ogunode, born in Nigeria, set the Asian record of 9.91 seconds at the 2015 Asian Championships in Wuhan, China. Su dashed to 9.90 seconds, a possible new Asian record, at this year's Diamond League Eugene meeting, but that failed to be certified by IAAF due to a tail wind of 2.4m/s. The 100m world record of 9.58 seconds was set by Bolt at the 2009 World Championships. Su continued his hot momentum into the year of 2018, after claiming the silver medal at the World Indoor Championships in Birmingham early in March with a personal best of 6.42 seconds and becoming the first male Chinese to win a global medal in an individual event. Italy's Filippo Tortu bagged the silver with 9.99 seconds, while the third place went to South African sprinter Akani Simbine at 10.01.